Today, we’re going to show you an easy way to check your laptop battery . You’ll be able to see how the battery’s charge capacity has changed since your laptop (or battery) was new. Like most rechargeable batteries, laptop batteries capacity and performance degrade with age. An older laptop battery cannot hold as much charge as a newer battery. The lower the battery’s capacity, the less time you’ll have to use your device while on battery power. 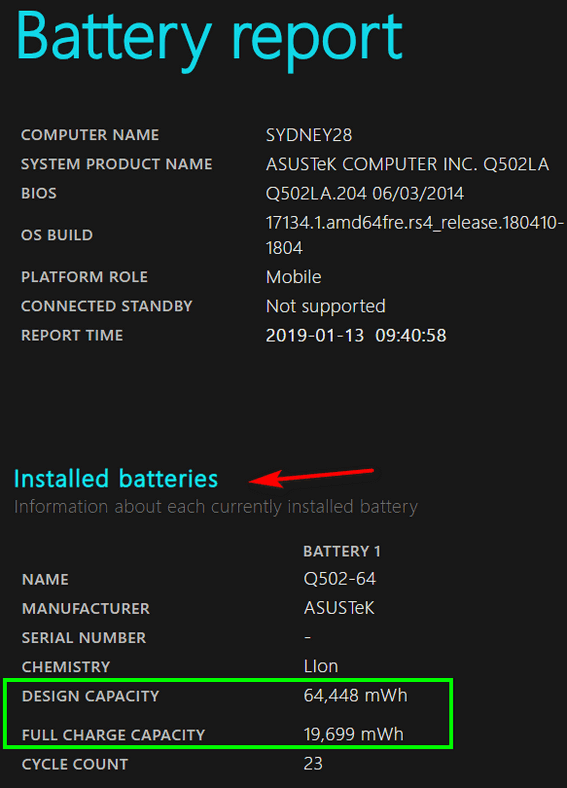 Windows 10 allows you to check your battery’s health quickly. And it’s easy to do. 4:) After a few seconds you’ll see that Windows has generated a battery-report.html file and saved it in C:\Windows\System32\battery-report.html. 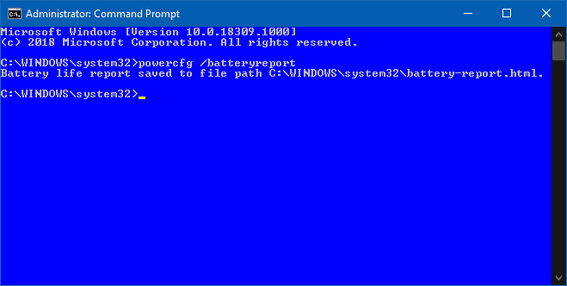 In File Explorer, navigate to C:\Windows\System 32 and find the file named “battery-report.html”. Hint. 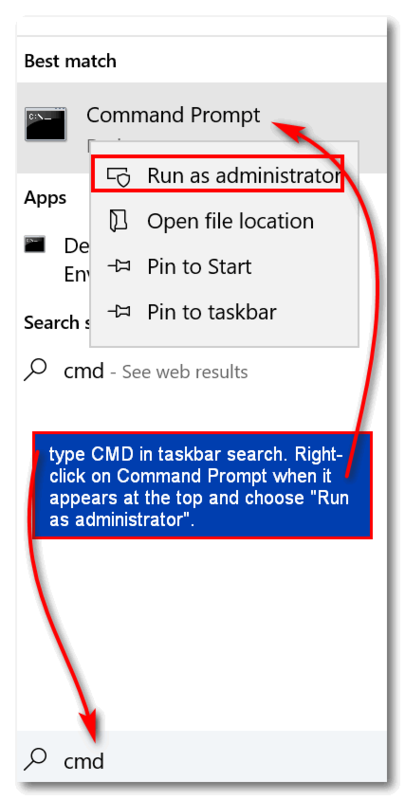 Once you navigate to C:\Windows\System32 type battery in the File Explorer search and the file will appear at the top. When you open the battery-report file, you’ll be able to find out how healthy your battery is. 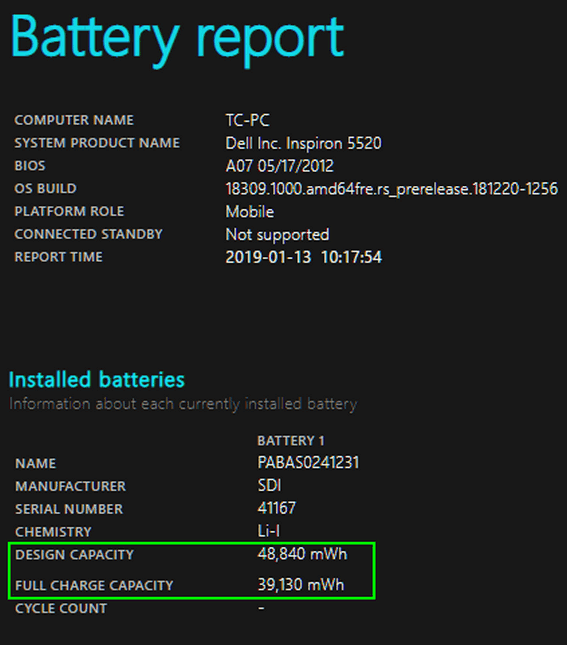 If you look at the battery report above, you’ll see my 3-year-old ASUS laptop battery’s designed capacity is a lot more than its current capacity (it’s just a little less than 1/3 of design capacity). That’s not good and it means it’s time for a new battery. If I continue to use this laptop and it’s on battery power, I will have less than 1/3 the amount of time I did when this computer was new. Unfortunately, this ASUS has a sealed battery and it can’t be removed. Above you can see that this 7-year-old battery is still able to hold 80% of its original charge. Plus, the Dell has a removable battery which can be replaced. But with 80% of its design capacity remaining, I’m not going to have to buy a battery for it any time soon. So, how’s your laptop battery? I don’t have a laptop but I have one I want to check this on. That Dell laptop is up in age as well. Thank you. A very helpful tip. Thanks. Did you mean the space before the slash? 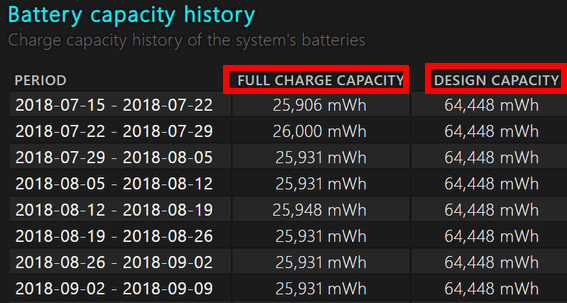 My Dell shows a design capacity of 99,000 mWh, full charge capacity 99,931 (yes greater than design) & after 3.5 years the full charge is still 99.931. I don’t use it on battery very often & do leave it plugged in all the time. I have made no effort to occasionally ‘drain’ it periodically as I see sometimes suggested. Check Settings >System > Battery. Gives Battery capacity as a %. Much easier. In the first place, all these types of batteries are sealed, but whether they are directly unpluggable from the bottom of the case or are bult-in – both are replaceable. Just a bit more (careful) work for the built-in one. It may not be the absolutely exact model, but the method is the same. In the first place, all these types of batteries are sealed, but whether they are directly unpluggable from the bottom of the case or are built-in – both are replaceable. 1.Sorry for the double post I tried to edit, but resulted in a double post. Please remove the first answer. The Power Efficiency Diagnostic library (energy.dll) could not be loaded. If you’re missing Windows system then some things are not going to work. We cannot write tips that work on 100% of all computers because all computers are not the same. We can only write tips that work on most computers. If you have problems with Windows system files perhaps you should run SFC and DISM as described on this page or try a repair install as described on this page.